In 1965, while serving as an assistant minister, Pastor Roger McManus was impressed that the Lord wanted him to establish a new church in the Chicago area. He spent much time in prayer, actively searching for the Lord’s will in the matter. One evening at church, a woman approached Pastor McManus concerning a need in an area in Niles. She said that the church of which she was a member was not able to continue and had closed its doors. More remarkable, she said that the building in which they had been meeting was available and that the rent would be a grand total of a dollar a year. This certainly seemed to be the answer to prayer. When a fellow pastor in another state heard this news, he sent a letter to Pastor McManus with a dollar enclosed, stating that this was the greatest miracle he had ever heard of in the starting of a church, and that he would like to pay the first year’s rent. How our church building became available is a strange and interesting story of its own. It is said that at a tent revival meeting, a Mr. Benjamin Lupton was dramatically converted to Christ. He donated this property and a church building was built and named “The English Church” due to the fact that most of the people in the area were German, and this church was the only one in which English was spoken. Mr. Lupton left it in his will that the property was to always be used for a church. Over the years, several different church groups met in the building, including the Niles Bible Church, which met in the building just prior to Pastor McManus starting the mission here. 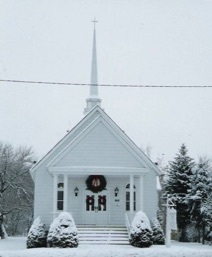 The property in which the church meets today was remodeled and enlarged in 1976, but the original building was built in 1870 and is the oldest building in the Village of Niles. It was given unofficial landmark status by the village at the time of its enlargement, with approval to keep the same architecture and type of material. On April 30, 1967, the First Baptist Church of Niles was organized with 14 charter members. From the very beginning, the Lord has been faithful and has supplied godly people to meet the needs for His work to be accomplished. God provided for his people who have ministered here and met the need of the time. Many have grown up or grown older in the church, and now their children and even their children’s children are serving here. Others were only here for a short while, but they were spiritually strengthened and served while they were here. How grateful to the Lord we are for all of those who have carried on the work through the years and those who continue to this very day. Today, the First Baptist Church of Niles still stands faithful in the community as a voice for the God it serves. Hundreds of people have passed through its doors and their lives have been dramatically changed. Many years have come and gone, and with God’s grace, this church will stand for many more years as a bright light in the great community of Niles.